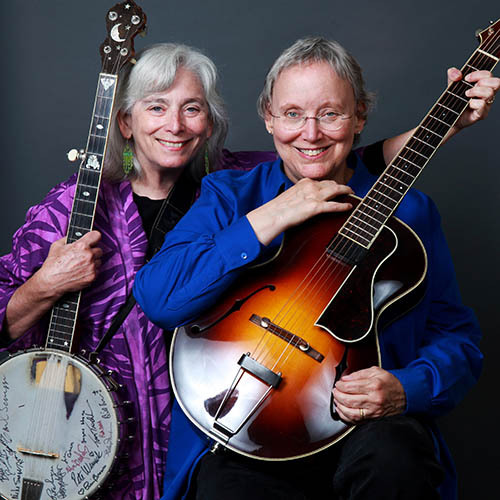 TWO-TIME GRAMMY® Award Winners, Cathy Fink & Marcy Marxer are master musicians with a career spanning over 35 years. Their superb harmonies are backed by instrumental virtuosity on the guitar, five-string banjo, ukulele, mandolin, cello-banjo, and many other instruments. An eclectic folk festival on their own terms, their repertoire ranges from classic country to western swing, gypsy jazz to bluegrass, and old-time string band to contemporary folk including some original gems. Their versatility defies a brief description. Perhaps “well rounded Americana” does it best. They have entertained the Queen of Thailand, been keynote singers for the AFL-CIO, performed at hundreds of folk festivals, appeared on the "Today Show" and on National Public Radio. They have advocated in Washington for unions, health care for children and the rights and livelihoods of artists. In February 2017, the duo released their 45th recording, “GET UP AND DO RIGHT”. The album features duets of some of their favorite songs by songwriters such as Alice Gerrard, Tom Paxton, Ola Belle Reed and David Francey, with an original tune and song for good measure. The last piece, “Song of Joy” is by their good friend Ken Whitely and includes percussion and a vocal ensemble the duo created with their own voices. They are happily known as “social music conductors” ready to start a jam session, a community sing or to create a music camp helping others learn to play and sing. Past students include Kaki King and Rhiannon Giddens. Through their long relationship with the Music Center at Strathmore they collaborated with positive hip-hop artist Christylez Bacon. They continue to mentor up-and-coming artists on navigating the professional music world. As curators, performers and hosts, Cathy & Marcy produce two annual shows at The Birchmere, in Alexandria, VA. The Mike Seeger Commemorative Old Time Banjo Festival is in its eleventh year and their Tribute To Hank Williams in its twenty-first year. Their annual weeklong Ukulele & Guitar Summit at Strathmore goes into year nine in 2017. Cathy & Marcy have earned two GRAMMY® Awards for their recordings “cELLAbration: a Tribute to Ella Jenkins” and for “Bon Appétit!". Their CDs “Postcards” and “Banjo Talkin’” were both GRAMMY® nominated in the Best Traditional Folk Album category. They have also produced recordings by Tom Paxton, Si Kahn, Ysaye Barnwell, Sam Gleaves, M.S.G. Blues Trio, Patsy Montana, Bonnie Rideout, Bill Harley, Pat Humphries and many other artists. In 2004 the Martin Guitar Company honored the duo with their own signature Martin Guitars, the MCH-Cathy Fink Model and the MC3H-Marcy Marxer model. Influenced by Mike Seeger, Marcy re-discovered the four-string cello banjo, inspiring the Gold Tone Company to make the Marcy Marxer model cello banjo, now played by Tim O'Brien and Ricky Skaggs. She also designed her signature Kala Ukulele, now played by over 150 uke lovers. Cathy is a three-time winner of the West Virginia State Banjo Contest and plays banjos made by Kevin Enoch, Larry Sifel, George Wunderluch and Will Fielding. Cathy & Marcy currently live in Silver Spring, MD and Lansing, North Carolina.